Also available as a book, ebook and on CD! Now when the king was settled in his house, and the LORD had given him rest from all his enemies around him, 2 the king said to the prophet Nathan, "See now, I am living in a house of cedar, but the ark of God stays in a tent." 3 Nathan said to the king, "Go, do all that you have in mind; for the LORD is with you." 4 But that same night the word of the LORD came to Nathan: 5 Go and tell my servant David: Thus says the LORD: Are you the one to build me a house to live in? 6 I have not lived in a house since the day I brought up the people of Israel from Egypt to this day, but I have been moving about in a tent and a tabernacle. 7 Wherever I have moved about among all the people of Israel, did I ever speak a word with any of the tribal leaders of Israel, whom I commanded to shepherd my people Israel, saying, "Why have you not built me a house of cedar?" 8 Now therefore thus you shall say to my servant David: Thus says the LORD of hosts: I took you from the pasture, from following the sheep to be prince over my people Israel; 9 and I have been with you wherever you went, and have cut off all your enemies from before you; and I will make for you a great name, like the name of the great ones of the earth. 10 And I will appoint a place for my people Israel and will plant them, so that they may live in their own place, and be disturbed no more; and evildoers shall afflict them no more, as formerly, 11 from the time that I appointed judges over my people Israel; and I will give you rest from all your enemies. Moreover the LORD declares to you that the LORD will make you a house. 12 When your days are fulfilled and you lie down with your ancestors, I will raise up your offspring after you, who shall come forth from your body, and I will establish his kingdom. 13 He shall build a house for my name, and I will establish the throne of his kingdom forever. 14 I will be a father to him, and he shall be a son to me. When he commits iniquity, I will punish him with a rod such as mortals use, with blows inflicted by human beings. 15 But I will not take my steadfast love from him, as I took it from Saul, whom I put away from before you. 16 Your house and your kingdom shall be made sure forever before me; your throne shall be established forever. 17 In accordance with all these words and with all this vision, Nathan spoke to David. 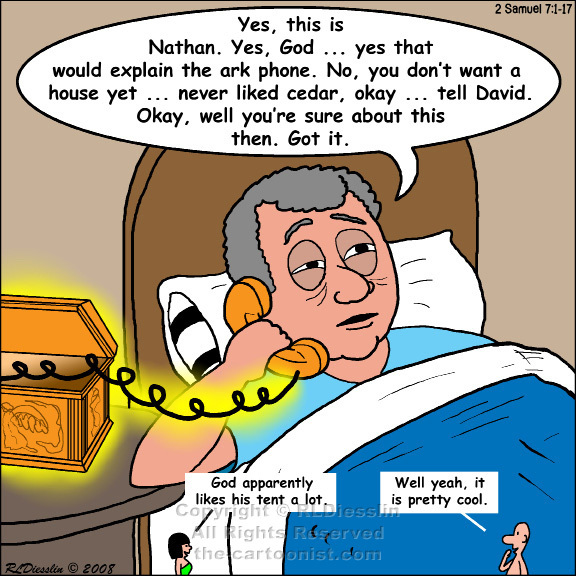 David gets the idea that if he has a nice house, God would surely want one too. However, God seems to prefer camping for the moment. Later he will have Solomon build God a formal temple. Perhaps God did not like David's interior decorator or something. Enter Nathan, a prophet along the lines of Samuel and initially in favor of the temple, to be the messenger for God to tell David to wait.